The research, which was unveiled last night in a Sydney Science Forum talk, Galloping Genes, has not only focused on racing performance, but also for the first time considered a range of traits including career length and susceptibility to diseases. With Melbourne Cup next month and Black Caviar's daughter one of the most valuable female yearlings in Australian history if sold next year, timely research led by Dr Natasha Hamilton sheds light on the extent to which offspring resemble their parents. 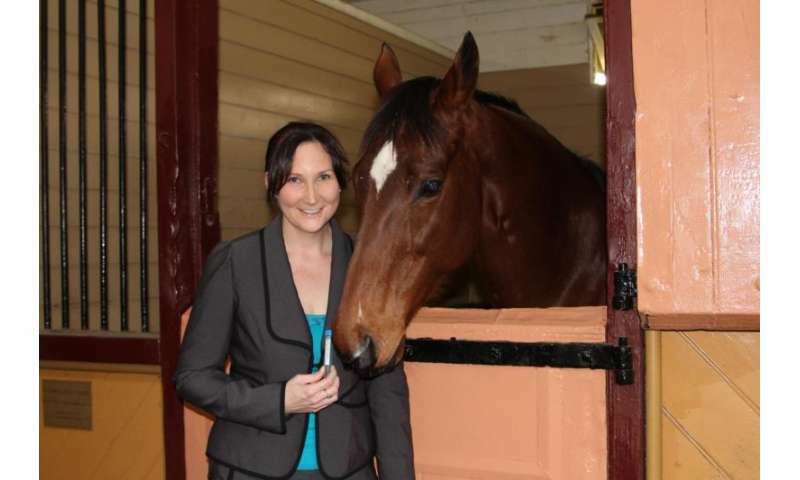 Dr Hamilton, a senior lecturer from the Faculty of Veterinary Science, said although studies had shown genetics accounts for about a third of a horse's performance, DNA analysis could do much more than just identify odds on winning a race. "We are learning more about the influence of genes not only underlying racing performance and disease but also about health-related traits such as risk of fracture," she said. This latest research has focused on the genetics of durability—or how sound a horse is—including factors such as career length and number of races. The work, supported by Racing Australia (formerly RISA and the Australian Studbook), has involved analysis of racing and pedigree records spanning 10 years from 164,000 Australian racehorses. "We have established that these durability traits have a low but significant heritability, indicating that horses' racing careers could be improved through selective breeding," Dr Hamilton said. "This knowledge could be applied in the future to improve the overall health, soundness and therefore welfare of the racehorse population."